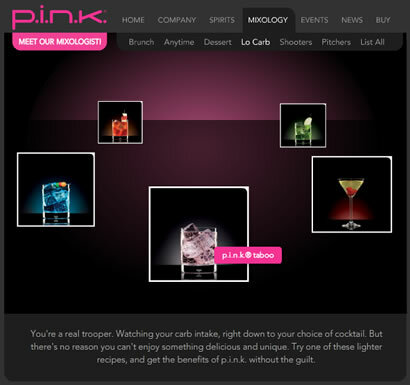 This high-profile consumer site was built for p.i.n.k. Spirits -- a new premium liquor company which creates various liquors infused with caffeine and guarana. The best way to describe their product is your favorite liquor and RedBull, without the RedBull taste, calories, or color. The first product to launch is vodka, with gin, tequila, rum, whisky, sake and others to follow in 2008/2009. - The site makes great use of a couple of open source tools: SWFAddress 2.0 and SWX. - The site was almost 5 months in design and development. - SWX is used extensively throughout the site to communicate with the back-end content database. Once again this made the creation of the CMS go much faster and communication between the site and CMS much smoother. SWX is also used for e-mail list sign-up, and I have released this service open source as part of the SWX contest. - An extensive listing of drink recipes, events, and venues can be found on the site. 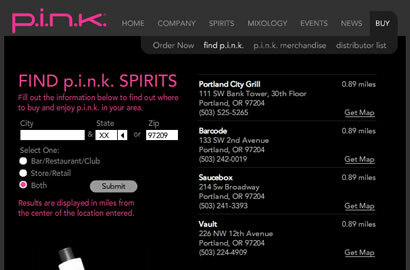 - A custom retail store and bar/restaurant locator was developed for the site, providing users with the distance from their ZIP code to the local places they can find pink's products. I may release this as a SWX service in the future. - I contracted with The Bailey Group of Philadelphia, PA on this project, whose talented designers concepted the site and team was great to work with. - A huge thanks goes out to Jason McCoskery, who again was a great partner in development and whose overall development knowledge in both PHP and ActionScript is always enjoyable to work with. This turned out really nice. Cool site!